I recently had a friend ask me, ‘what can I do with rose hips?’ so I thought I would do a little digging and find some answers. Seeds make plants. Plants make flowers. Flowers make fruit. Fruit makes seeds. It’s a never-ending cycle. 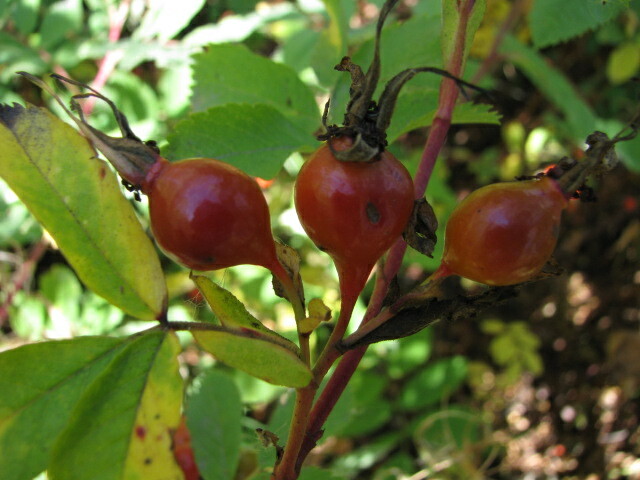 Rose hips are simply the fruit, or the seedpod of the rose plant. They are produced after the flower dies and often are brightly colored red and orange, adding color and winter interest to a garden. Old garden roses and shrub roses, especially rugosas, have showy hips. Stop deadheading at this time of the year to ensure a good crop of rose hips. Besides adding beauty to the winter garden, rose hips will attract wildlife, especially foraging birds. 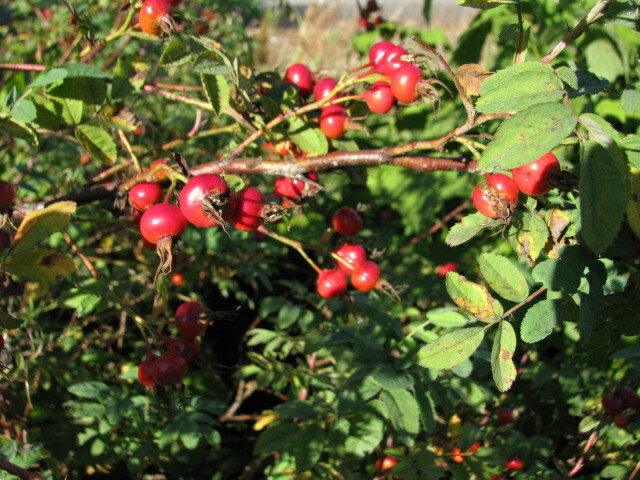 Rose hips are edible and have many culinary uses, including teas, jellies, jams, sauces, soups and seasonings. Here is a link to a jam/jelly recipe that looks tasty. I wonder how it compares to other fruit jams; it’s said to be sweet and somewhat tangy. http://simplyrecipes.com/recipes/rose_hip_jelly_and_jam/ For rose hip tea, steep 4-8 fresh hips in a cup of boiling water for 10-15 minutes. Rose hips are loaded with vitamin C, so this should be a good winter drink. Harvest is best after the first frost when hips are sweeter. Inside the hips the seeds may be covered in fine hairs which are irritating, so remove these before using. To prepare, trim the ends off the hips, cut in half and remove the tiny hairs and seeds. Then rinse the hips and use them fresh or dry them for use all year. After drying, rose hips can also be ground. This powder will add a mildly sweet flavor to hot beverages and provide vitamin C, iron, calcium and phosphorus. Remember when harvesting not to use the hips from any plants that have been sprayed with pesticides, so picking off the side of the road may be hazardous to your health. This link, http://www.backwoodshome.com/articles2/butler95.html, has a recipe for rose hip syrup that is yummy on pancakes, waffles or ice cream. What a great idea, since we don’t harvest much maple syrup in the Pacific Northwest. Our native roses are the Bald Hip Rose and the Nootka Rose. Go out and enjoy our native fruit! Next Next post: Squirrels Like Cherries!